After years of pain in both legs, Jim Hale, 53, ultimately decided to take his doctors advice and have total knee replacements on both knees. He was very apprehensive about having surgery, but was pleasantly surprised that post surgery he experienced very little pain. He attributed that, in part, to PT sessions at Active Life and Sports Physical Therapy prior to surgery. He was up on his feet with a walker beginning in-hospital therapy the very next day. He quickly progressed to a cane. He started outpatient physical therapy immediately following discharge from Sinai Hospital. He was amazed how fast his progression and outcome from physical therapy were. Now, five months post surgery, he is exercising regularly and bowling pain free. He has also seen overall fitness gains which he has attributed to both the physical therapy and the post-care individualized fitness program that was designed for him as a gym member of the Active Life and Sports Fitness Center. 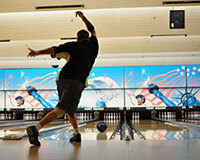 His original goal was to participate in the national Bowling Tournament in Reno, Nevada this June. He stated he feels 'as ready as he could ever be.' He attested to the fact he would have never reached his high levels of success without the staff of Active Life and Sports. Here at Active Life and Sports we are grateful for the opportunity to have assisted Jim and we wish him success throughout all his future endeavors. James "Binky" Jones is an amazing man and athlete. He is a husband, father of two children ages 11 and 7, and works full-time as a vocational teacher for disadvantaged youth. And, at the age of 37 Jones is competing at the professional level in the sport of Mixed Martial Arts. This is especially significant because his career was almost cut short by a neck injury in 2006. James lamented that "the pain was so severe that I thought I would never fight again". He had been unable to do any Jui Jitsu or Boxing moves without pain in his neck. He was even having difficulty sleeping at night. Jones had been dealing with this problem for almost a year and had been to a number of practitioners prior to coming to Active Life and Sports. After several weeks of manual therapy and exercise, he was able to return to training and finally competition. In fact, Jones succeeded in becoming the Ring of Combat Lightweight Champion in 2007. He recently signed a professional contract for two additional fights. At Active Life and Sports we wish Jim the best in his career and in life. We are grateful for the opportunity to have made a significant contribution. When we think of retirement activities we often think of leisurely days filled with chasing a golf ball, playing cards and shuffleboard or bachi. But, those kind of activities just don't cut it for Jim Young. At the age of 71 Jim continues to operate his business, "Herche's-Young Interiors Work Room" which creates custom draperies, upholstery and other related products. 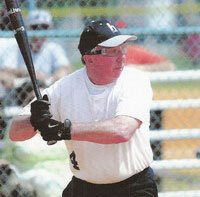 For fun he plays on "Hammels" a nationally competitive softball team in the 70-75 year old division. Hammels is a tournament team in the Triple A Senior Softball League. Jim's softball career almost came to an end recently when his right shoulder became painful to the point where he was unable to throw. He sought the help of Dr. Alan Lanzo, Orthopedic Surgeon, who repaired his rotator cuff. He chose Active Life & Sports for his rehabilitation. Prior to his surgery Jim could do most daily activities but he could not throw a ball. Being able to throw again was the primary reason for undergoing this surgery. Jim stated "therapist Mike Wah gave me great confidence that he could help me to throw again". Jim participated consistently and aggressively in his rehabilitation program. He gained full range of motion and made great strides in gaining strength. Much to his relief and joy he was able to return to participation with his softball team. In Jim's words "as a 71 year old softball player I am able to look forward to many more days of play and continuing to work in my business". At Active Life & Sports we are proud of Jim and his achievements. We are grateful for the opportunity to have helped him get back in the game of his passion. "My therapist is a very compassionate physical therapist. He takes the time to know you in order to provide the treatment that is best suited for your injury/condition." "Service was provided in a very professional manner - no suggestions for improvement. Jeff's work is excellent. Very satisfied with the entire staff and establishment. My therapy could not have been more thorough." Physical therapy in the past for my back problems didn't help, and I had to live with the pain for 15 years. The progressively worsening pain led me back to my doctor who recommended ALS for therapy. I feel better and am mostly pain free with the ability to independently manage my symptoms. "The best physical therapy facility I have been at and I have been to quite a few. Nice people! When I first came to ALS after total hip replacement, I was unable to lift my leg off the bed when lying down. After exercises in the gym and pool, I can now walk without any limp. My concerns were listened to carefully and addressed directly." "Thank you for the wonderful therapy experience after getting my left knee replaced. You did an excellent job, as always. Everything was handled efficiently and with a personal touch. You have a great team at Active Life * Sports. All are caring and encourage you to do your best. I would not hesitate to recommend your services to anyone. I am very happy with my new knee and my progress. Again, thank you so much for everything." I have known Mike for many years (more than 15 years) since he owned and managed Advanced Injury Management. I have always enjoyed working with Mike due to his knowledge, reliability and professionalism. In all the years, no matter if referred to Advanced Injury Management or now Active Life and Sports, I have always had a good outcome. Mike and his staff pay attention to each individual's needs in order to motivate the patient to achieve the best outcome from the program (e.g., a patient who had some knowledge and background about fitness) with a shoulder injury and had surgery did not feel PT would add any value to his recovery. Active Life and Sports staff was able to change his view and cooperate with his therapy program and return to his regular duties. Another strong point is their experience working with employees, which is a very important component in the Worker's Compensation. Active Life and Sports is able to provide on site work hardening program at the job site to avoid the patient being out of work again due to the attendance hardening program. I also intend to refer difficult cases or cases with specific requirements from employers to Active Life and Sports since I know that Mike and his staff's professionalism will get the job done.